Priva Extra Absorbency Liner is an extra absorbency liner this is machine washable and reusable. This Incontinence Liner provides protection for heavy loss of bladder control. Manufactured by FiberLinks, the Priva Extra Absorbency Reusable Liners is designed in an hour-glass shape for a comfortable fit. Soft terry knit shell next to skin promotes good skincare. 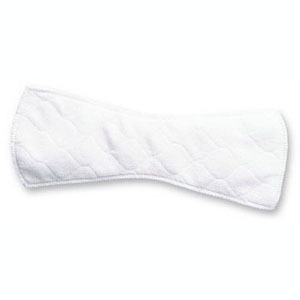 Hourglass shaped pad prevents potential pressure points. Fits comfortably inside underwear or briefs for added absorbency. Effective discreet protection for the active adult. Machine wash and dry bleachable.